I'd been almost bombarded with cruelty over the past week but this evening I was hit with some kindness. 7th blast took place in Sri Lanka. Picture speaks truth regarding innocent blood . Unfortunately human turned as wild beast. Various parts of district Kotli are facing cuts of electricity anywhere between 0800hrs and 2000hrs for over a week now. We are informed - informally - that this is to re-set electricity cables in the wake of the ongoing 102 MW Gulpur (Braali) hydro-power project which we understand - like virtually all other such projects - is going to produce electricity (here in AJK( to directly deliver it (there to Pakistan). The lower riparian climbs up with his military to warn us of another lower riparian killing our people because they are 'the other'. The 'warner' claims to be your genuine sympathiser, after-all he is your co-religionist. Sooner rather than later. both lower riparians decide to share the water between themselves without consulting the upper riparian. Who is conveniently divided between the two lower riparians using identical propaganda. One in the name of democratic secularism, the other in the name of militarised religion. This is just one of many hydro projects undertaken by the Pakistani State in AJK, all without due process, legality, environmental concerns, proprietary rights and many more questions within the framework of international law. Our Western neighbours are making the most of their de facto presence here. We now have to do without electricity throughout the working day for an unspecified period of time. This is load-shedding times six. These imposed sacrifices are just heaping up, almost by the day. Finding the ways forward on Kashmir is an article by Nitasha Kaul (Associate Professor in Politics and International Relations at the University of Westminster in London) published by the Centre on Constitutional Change in the UK. This is probably the most lucid and compact commentary on present day Jammu & Kashmir. On the last sentence, I would suggest "credible nonpartisan internationally supported spaces" should be complimentary or even symmetrical to genuine activism on the ground within the territory. At this mature stage of public interest activism on the ground, the most obvious barrier to change - that the majority of us aspire to - is how we think about public rights and our approach to obtaining them. If we cannot convince our Pakistani neighbours to exploit us just a little less than they do, how on earth can we convince India or any major power in the world to give us political concessions? In the last 72 years, we've grouped together with the Pakistanis - because they are nominally Muslim - and used the strength of our diaspora and devoted local resources to help Pakistan advocate on behalf of the Valley Kashmiris, on the perceived strength that they are majority Muslim too. So, we clearly have a majoritarian Muslim lobby advocating in non-Muslim Western capitals for political concessions at the expense of another non-Muslim country, which could soon become the 3rd largest economy in the world and which incidentally also has a size-able Muslim minority that is larger than the population of AJK, GB, the Valley of Kashmir and Pakistan combined. We are willing to sacrifice all aspects of governance in AJK to continue pursuing this illogical, mob-like stance to somehow 'pressurise' the world into accepting our demands. Incredulously, we blame our absence of success thus far on an anti-Muslim bias in the West without as much as thinking twice about how we present 'our' case. Our diaspora in the UK which constitutes the largest community of our people outside AJK are particular culprits in this regard. They enjoy the fruits of 'rule of law' and economic opportunities there only to dissuade activists in AJK from struggling for the very same. "Don't waste your time here. It is pointless fighting for rights here. The big powers will decide this issue whenever it suits them." So said someone in my village who has enjoyed the best part of 6 decades in the UK. If we have no value for our own environment and public space, how can we expect the world to take us seriously? If we don't give due attention to what is in our own capability, why should anyone else use their capabilities for our benefit? Geo-politics doesn't do free lunches. If we can't agree on the need of a consensus for a political process that could ensure AJK controlling its own public affairs, how can we convince any major power to force India to surrender the Valley of Kashmir, that which we have foolishly surrendered to our Muslim neighbour? Still in the village. Meeting villagers from morning till evening doesn't leave much time to oneself or the work that prevents me from returning to the UK, where I would be likely to meet even more villagers. Got quite a bit done today. In fact, I've made progress on various tasks that have been pending for years. It does make one think: "Why didn't I give attention to this matter before?" The 'Save Rivers - Save Lives' Movement is also described as 'Save Rivers - Save Muzaffarabad'. Today, the movement entered its 23rd day of a sit-in protest in Muzaffarabad and it was well complimented by a protest outside the Pakistani embassy in London, by AJK Civil Society - UK. I liked it for a couple of reasons. The first relates to the existence of a conscientious citizenry which is what we're striving for here in AJK. So the news is inspirational in that sense. Secondly, the fact that its a majority Muslim country indicates that at least some such countries - Tunisia is another example - where Muslim society is actually coming to terms with the world they live in. Ajk and GB are part of Pakistan, I don't use propaganda. People like you use propaganda to try and tarnish the image of Pakistan but Allah makes you fail every time. Anyway leave me alone now I really don't want to talk with you. If we were to assume that AJK and GB were indeed a part of Pakistan, then why does Pakistan advocate a solution via a UN plebiscite? Acting as an owner (without legal reference) and then claiming to advocate self-determination for the Valley Kashmiris is pure chicanery. We've been without electricity since 0900hrs. Nothing new here, this is merely a small cost for azaadi, albeit without zimidaari. That is freedom without responsibility. In the words of our previous prime minister Choudhary Majeed, "We wish to remain in darkness so that Pakistan can be illuminated." The problem is: This type of foolish charity only makes the beneficiary even more cruel towards you. Such is human nature. Today, the current AJK prime minister decided to visit the sit-in protest conducted by civil society in Muzaffarabad at Azaadi Chowk, now into its 22nd day. Here's some notes (in Urdu) based on a conversation between AJK PM Raja Farooq Haider and Advocate Raja Amjad Ali Khan, spokesman for the 'Save Rivers - Save Lives' Movement. "Strengthen my hands and end this sit-in protest so that I can engage in meaningful talks (with Pakistan) on the rivers issue." "If you can bring a copy of WAPDA's (Water and Power Development Authority - of Pakistan) agreement on its planning for electricity (in AJK), then we're ready to immediately end this sit-in protest." "WAPDA is not taking our (public) affairs seriously and neither is it willing to make an agreement with us (AJK)." "The forthcoming (tomorrow - 16 April) protest in London (outside the Pakistani Embassy there) in favour of the sit-in protest (in Muzaffarabad) will be used by India as propaganda against Kashmiris." "The sit-in protest (here) is into its 22nd day. 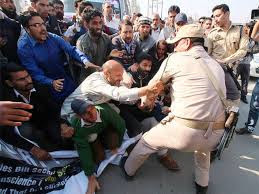 Kashmiris also protested outside WAPDA House (their headquarters in Lahore) but the bureaucracy of WAPDA didn't even flinch." "We don't want to create any administrative issues for you and neither is this sit-in protest against the Azad Kashmir government." "This is a protest against those (forces) who are not willing to enter into an agreement with the Azad Kashmir government. By asking us to end this sit-in protest, you are favouring them." "A matter that can be settled amicably should not lead to rancor (hostility)." "I am a son of the soil. This is where I will (always) live." "This is why we want to strengthen you, so that WAPDA is compelled to make an agreement with the Azad Kashmir government." "If WAPDA doesn't want to fulfill the conditions for an NOC (No Objection Certificate) from (our) Environmental Protection Agency then it should invoke an independent international environmental study and follow its recommendations." "A file for creating water bodies on the dry bed of the river is on the desk of Imran Khan, prime minister of Pakistan." "The prime minister of Pakistan has assured us that issues will be resolved." "You had said (in the past) that we will not allow the River Jhelum to be diverted. (However) you have now supported the building of a tunnel there." "Some sacrifices have to be made (after all)." And the electricity in my region returns at 1830hrs, after 9 and a half hours. In the village but fully equipped. More than 24 hours of angst that I can't even write about, yet. I am way behind in terms of catching up with work. I can't even explain the subtleties to my co-citizens. They want me to do many things and be at more than one place at a time, yet don't examine my capacity studiously enough. Conscientiousness is a rare art in AJK, too fine and refined to digest. One does have to look at change as a serpentine marathon. Goodwill has to be dug out and is rarer than gold most of the time. This photo was taken in Muzaffarabad yesterday, outside the sit-in protest at Azaadi Chowk, Muzaffarabad. The 'Save Our Rivers - Save Our Lives' movement is now into its 20th day (It began on the 24th of March). The same Azaadi Chowk where I was prevented from conducting a hunger strike last year, almost to the day (Day 100 of 2018). The police had forced me to accompany them to the police station within minutes of our banner being erected there. It is important to understand all the dynamics at play here. An oversight. Missing out on blogging an entry for Day 101 of this year. His duty is to protect the colonial interests of the Pakistani State. Nothing less, nothing more. You have to live up to the challenges ahead of you. If you pull back, you'll be committing an injustice even worse than the injustices that you are fighting against. So I missed yesterday's post after my most consistent spell of daily blogging ever. Just for the record, I blogged for 83 days - daily without fail - from Day 11 to Day 93. 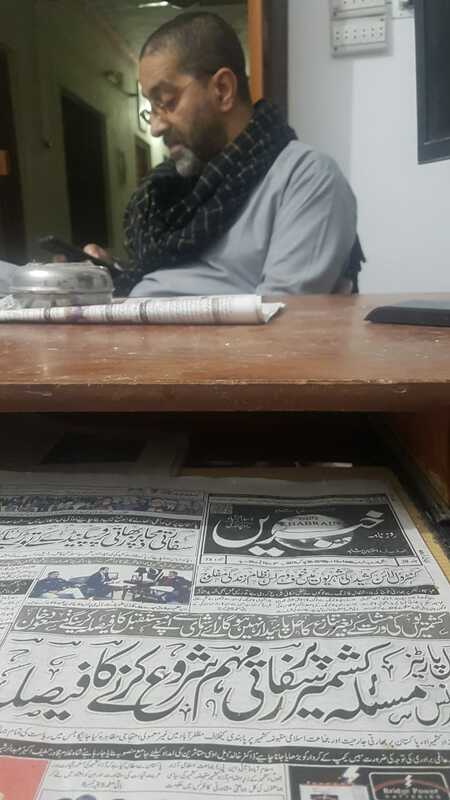 I have spent the better of yesterday evening and into this morning studying the information surrounding the eventual death of 28 year old Raja Waqar Turk in CMH (Civil & Military Hospital) Muzaffarabad at 9.25 pm (02/04/19). He was allegedly brutalised by representatives of the Muzaffarabad police after an incident at around 11.15 pm on Thursday night (28 March) and had been on a life support machine since. Unfortunately, as I'm in a remote village I am unable to bring you the comprehensive report as wished, as yet. There has been a phenomenal amount of investigative work done by civil society, particularly in Muzaffarabad. I wish I could show you photo and video footage but I'm also without my toolkit, thus have limited functionality. I haven't slept all night as I've been in almost constant interaction, both at home and abroad. Waqar Turk death was an accident or Murder? Who are the people in CCTV with sticks battens? Is police involved in the death of Waqar ? 28 years old Waqar Turk died at 9.25pm in CMH Muzaffarabad reportedly following a fall from local building in Khawaja Bazar near Khalid Photo studio under highly suspicious conditions. According to some reports he was followed and tortured by police before the fall and police allegedly made him fall or even thrown him down. While, police claims that they never attended the place of incident, the eyewitnesses report that police was seen chasing and beating Waqar on the roof after 11pm on Thursday 28th March. Right now protests are taking place in the capital city of Pakistani Administered 'azad' Kashmir. District Commissioner has arrived and is demanded by the relatives and protestors to register FIR against the police people recorded approaching the site of accident on the CCTV at the time of the incident. Previously parents were assured by the DSP Riaz Mughal to carry out thorough investigation to reach to the bottom of the matter and bring any one responsible to the court of law. Eye witness accounts corroborate CCTV evidence of alleged Muzaffarabad (City Thana) police involvement in brutality of now deceased Raja Waqar Turk. His post mortem also confirms torture marks before he allegedly 'fell' off a roof in the commercial hub of Khwaja Bazaar. It should be pointed out in public interest, that I had explained in detail the proclivity towards violence of the current administration in AJK, a couple of months ago. On the 7th of March last year I had also warned the administration of the likelihood of serious casualties if they tried to forcibly control public protests near the LOC in Poonch in future. This was a day after they had used strong-arm tactics to disperse a public rights agitation in Dwarandi, tehsil Hajeea. Barely a few kilometres from where Naeem Bhat was fatally shot 9 days later, on the 16th of March (2018). They listen but don't act. Our background research into Raja Waqar Turk's alleged police murder indicates that the public of Muzaffarabad has been increasingly incensed over the past few months, particular over the allegedly unlawful behaviour of Muzaffarabad police. Raiding people's houses without legal process and extorting benefits just like in Indian popular cinema, have almost become a norm. Two sub-inspectors, namely Zia ul Islam and Manzar Chugtai have become particularly notorious in the city for such aforementioned behaviour. I have finally managed to slot in a detailed report on the alleged murder of Raja Waqar Turk by representatives of the Muzaffarabad police. Over the past few days I've been tinkering with the design of a favicon for this website. Indian state has been atrocious indeed & that has been well exposed. But the other side backed by the neighbouring state has also created lots of graveyards in Kashmir. Even though, their stories don't get accounted much for reasons known yet unknown. Violence has blinded us. The tweet above essentially reminded me of that. Note this down: The resistance in Kashmir is Muslim. It has always been Muslim. From Dogra regime to Indian occupation, resistance in Kashmir has been Muslim through and through. 'Islamization', 'Islamist' are just dog-whistles. Even our fight against Dogras was called communal. The fire does not cease, especially in Spring. Tithrinote, Battal, Mandhol, Serra, Darra Sher Khan, Tahi, Tattapani and Goi are all affected. Civilians have been witnessing heavy cross-fire since this morning. The new year may have started almost 90 days ago but technology is not keeping up with me or I am not keeping up with it. The latter was abundantly obvious earlier today, as I had to scratch hard at my head while watching various programmes freeze when multitasking. Islam doesn't belongs to Pakistan. How badly corrupt elite of Pakistan manipulated Islam by supporting proxies. The creation of Pakistan is plan B of Britain to modify occupation methods on subcontinent by using corrupt people's. All Muslims of subcontinent are oppressed today . Entered into its 5th day has this sit-in protest in Muzaffarabad, against the water aggression of Pakistan and China. Close (stop / end) this water aggression! As you can read at the end of the tweet, they are beckoning Pakistani media to take notice. Unfortunately, that country's media has traditionally been slow or even non-existent when it comes to coverage of issues that - by definition - question Pakistan's control of this territory. This either indicates that Pakistani civil society is weak or that the State is unashamed of its hypocritical position: viz. advocate freedom for the Valley of Kashmir but suppress valid questions over your own presence in Jammu & Kashmir. This internal contradiction is what I describe as the internal enemy of Pakistan. You cannot attract investment into your country or expect the world to trade with you if you advocate one thing and do another. Pakistan is also concealing its poor utilisation of water as well as its inequitable distribution. Resources are controlled and used primarily for securing the State rather than enabling it to flourish. There is little point in heavily protecting an empty shell. With time, the neighbourhood as well as significant actors in the rest of the world will question Pakistan's mis-handling of the world's most precious resource. A resource that others could demonstrably prove that they can utilise better. I can't imagine a conflict worse than that. In the digital age, it would be difficult to conceal inefficiency or pure lust and greed with Islamic metaphors. The Pakistani State has many answers to give on its role in AJK and GB. By restricting its own media from honestly covering this territory, the Pakistani State is inflicting heavy injury on itself. If you study the slogans chanted in this video, civil society in AJK targets the Pakistani institution WAPDA (Water and Power Development Authority) and not the Pakistani State when criticising what is essentially State policy. The intelligence agents who patrol public opinion in AJK don't work for WAPDA, they work for the security agencies of the Pakistani State. Hence, WAPDA is a soft target and one that civil society can mobilise against society wide and gain open support without the seedy controversy of riling the Pakistani State, which earns you the slur of being anti-Islam. This is so because you would be openly rebelling against the fortress of Islam viz. Pakistan. So, the public rights narrative becomes stunted and then when negotiations do emerge to end the protests, personal interests are mobilised to muddy the narrative even further. The protestors become even more and more isolated over time and the cycle repeats itself periodically. From Mirpur in the 1960s to Muzaffarabad in the 2010s. Let's keep tabs on inspiring events around the globe too. Nation States cannot exist in isolation. 'Hard power' is far less effective compared to 'soft power' in the 21st century. So the digital age is proving it to be. New Zealand is ripe for isolation in a geographic sense, yet has generated a huge amount of soft power over the past couple of weeks. It is a successful country using any indicator of governance or public policy. It is most certainly not isolated. In fact, it almost seems as if it is at the centre of the world at the moment. Jammu & Kashmir is more central in a geographic sense than most other territories in the world. However, its isolation in every other sense reminds one of 'The Law of Averages'. The sun inevitably makes its presence felt, no matter how many days of rain follow each other. So, our aspiring citizens need to concentrate on soft power. Art, culture, heritage and all forms of expression of who and how we are. The world will take notice, especially if we are polite and refined about it. indianexpress.com’s server IP address could not be found. My immediate knee-jerk response to the above is that the opening of Sharda cannot be pre-conditioned by Pakistan. The Indian elections should not be a factor in this decision. If Muslims were barred from Makkah for 72 years, they wouldn't want to wait for a general election in a neighbouring territory to learn whether or not they could re-enter. We could write a treatise on this phrase but even without academic rigour or reference, there is a lot that we can discuss through the prism of every-day life. Let's remain focussed on society in AJK. The law of averages throughout the modern world in the context of mono narratives - in any given society - would suggest that they are not sustainable in the long run. As we're talking about societies in nation-States (particularly contested ones) and since the Europeans are the architects of this structure, we have licence to use examples from there or in that vicinity. Hitler's Germany, Mussolini's Italy and Stalin's Russia employed a mono narrative. The Pakistanis have employed a mono narrative in AJK and Gilgit Baltistan (we will usually adopt GB for short in a similar manner to AJK for Azad Jammu & Kashmir). The law of averages may dictate an inevitable failure. There are 2 almost distinct narratives that exist in AJK and GB. I say almost because no prominent narrative can be monolithic. One is an internal narrative and the other is a Pakistani narrative. Since Pakistan controls these 2 territories without legal reference, as being a respondent party of a non-enforceable forum (ref. UN chapter 6) doesn't provide a country de jure status. This dilemma compels Pakistan to base its control on certain assumptions that rely on the majority opinion of the internal inhabitants - the primary stakeholders in this conflict - to unconditionally support their stance. Hence it (Pakistan) considers it - as a matter of survival - to strictly control the public narrative here. Control the narrative and you control the territory. De facto. As simple as a white flag. Not recognising (or even acknowledging) the presence of other narratives is suicidal for a nation State. What if the United Kingdom didn't recognise that a Scottish aspiration for independence exists? What if England and Wales did not recognise that there are citizens who don't want a Brexit? What if the Catholics of Ireland didn't acknowledge that their Protestant compatriots had a different view on national politics? Closer to the Muslim world, what if Turkey didn't recognise that there are a significant amount of Turks who prefer to be part of a secular Europe rather than a rejuvenated Ottoman Empire? All aspects of governance, public policy and conflict resolution (an oft cited term in the context of Jammu & Kashmir) follow the cue provided by the State (assuming charge of AJK and GB), based on the contrived perception that an all-encompassing dominant narrative exists, that unquestionably but conveniently favours the State's accession to Pakistan. Even if we assume that Pakistan had entered AJK and GB in 1947 peacefully, by measuring the needs and opinions of the inhabitants beforehand and then legally sanctioned its presence, they would still have no right to impose a mono-narrative on these parts of the erstwhile princely State of Jammu & Kashmir. Some would argue that Pakistan imposes its narrative in AJK and GB in the manner that it does, precisely because it could not and cannot sway majority opinion in its favour. The average person who lives in this territory recognises that these 2 distinguishable narratives co-exist in real life. Everyday transactions between individuals in society reflect that average reality. They manage the 'occupation' (of course not everybody regards Pakistan as an occupier), hence society continues to function regardless. However, because it is militarised through external interference (primarily to protect that State's narrative), the territory has no internal control over governance and public policy and is compelled to abide by that Pakistani narrative, through social, economic, judicial and even at times extra-judicial means. The system cannot grow organically - on its own resources - both human and natural. A mono narrative is by definition autocratic, anti-life, suppressive of human instinct and simply unsustainable. There is little conviction in toppling one autocracy (the Dogra Empire) to become part of another autocracy. A Hindu autocracy, a Muslim autocracy or a Christian autocracy is by all means an autocracy. However, this current autocracy is hell-bent on extraction and expatriation. Dogra rule (1820s to 1947) can be rightly accused of many crimes but extraction and expatriation of resources is not one of them. The citizen of such a territory: be they day labourers, judges, politicians, academics or anything else will remain camouflaged to survive and succeed. If any internal entity or body peacefully challenges this imposed mono-narrative, they will immediately be accused of bias, working for the enemies of Pakistan and/or tabooed as a perfect candidate for being put in a mental asylum or at least deserving of some form of character assassination. In a system of governance that pivots its existence on bias, it is a cruel irony that bias is the first allegation that is provoked in response to an alternative narrative. It is quite possible that the most instrumental enemies of Pakistan are a product of the internal contradictions of that society. That could be the case in AJK and GB too. Introspection can deliver answers in each case I suspect. It is also possible that the mental asylum candidate could be a genuine candidate for the Nobel peace prize. In principle, there cannot be a difference between the nationalism of Balawaristan, Bengali nationalism, Indian nationalism, the nationalism(s) of Jammu & Kashmir or even Pakistani nationalism. Each philosophically justify their 21st century nationalism according to the structure of Westphalian sovereignty introduced in the 17th century. In an Islamic context, one nationalism cannot be halaal while another is haraam. One nationalism cannot be legitimate at the cost of the other and that is the basic flaw of the Indian Independence Act, drafted and hurriedly but partially implemented by the soon-to-depart British Raj in 1947. Let's return to the imposition of a mono-narrative in AJK and GB. 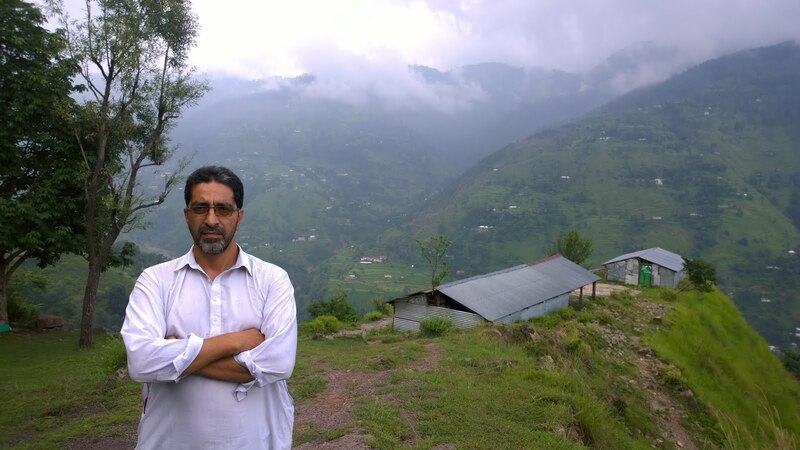 With the internal inhabitant still struggling to cover the journey from a subject of the Dogra Empire pre 1947 to an aspiring citizen of AJK or GB, it has been established that our proclivity to resolve our 'national question' has been stunted in a targeted manner, where fear is a lifelong companion for most inhabitants. It could be helpful to remember that the law of averages also dictates that many rainy days will inevitably be followed by a sunny day. When I instinctively decided to review the Pakistani female writer Anam Zakaria's compelling book on AJK 'Between the Great Divide: A Journey into Pakistan-Administered Kashmir', I felt it almost equally compelling to write the above as a preliminary review, which I may as well title as 'The Law of Averages'. PK Generals are coward morons , they are promised " hawyaa" for hypocrisy and using Islam for terror. They live a western lifestyle , drink alcohol and socialise ,Irrespective of religious believes but when it comes to fight , they use proxies and foreget ghazwa hind ? 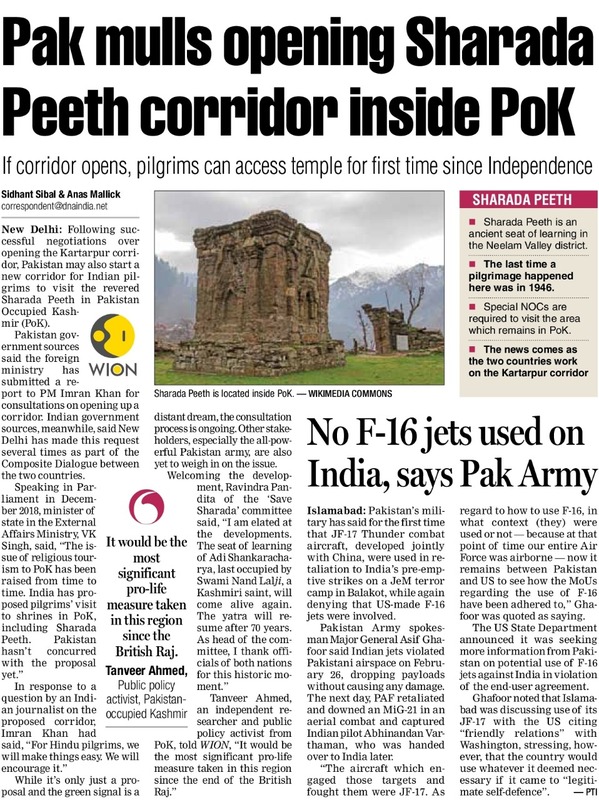 I have received confirmation that both India and Pakistan have come to some preliminary agreement on opening Sharda to the Hindu community of J & K and quite possibly from elsewhere too. Top sources indicate a positive development expected on the restoration of Sharada Temple and allowing Kashmiri Pandits & Hindu community of India to visit Neelum Valley of Pakistan Occupied Kashmir (PoK). My friend @rsrobin1 had first raised the issue with Pak PM @ImranKhanPTI. A whirlwind of attention has focussed on this issue, on both sides of the border between India and Pakistan, particularly today. It has kept me busy for most of the day too. I received further enquiries from various cities of what used to be an un-divided neighbourhood. "It would be the most significant pro-life measure taken in this region since the end of the British Raj". "It's positive implications for religious harmony, civilisational diversity, knowledge and wisdom accumulation will be felt globally". "It could even become the pre-eminent symbol of 'soft power' in the world". "Forgive the superlative laden description of Sharda but I feel it is warranted". The pivotal role driving this whole process forward has been that of Save Sharda Committee Regd. and in particular, the untiring consistency of Shree Ravinder Pandita. Amongst other contributions we cannot forget, is Vinod Pandita's 15 day hunger strike in 2014. It should be pointed out that this is probably the first time in 72 years that a serving head of government in AJK (titled PM since 1975) has visited a non-Muslim place of worship. Is the nation awake or asleep? Is it aware or is it ignorant? I think this is a meaningful way to engage global civil society or even globally recognised institutions, with an aim to increase genuine democratic space in each region of the State of J & K. This strategy should be consistent and creative in the way it presents its case. For example, even art can be used to convey the message, especially at multi-lateral forums globally. Having said that, this doesn't absolve Britain from its responsibilities in light of the Indian Independence Act. There is also much that can be done to make British MPs (especially those whose families originate from J & K) more committed to a democratic solution of this essentially British colonial legacy. As a large diaspora, we are most certainly not pulling our weight in accordance with our size and significance in the field of lobbying. Nevertheless, most important of all is the conduct and commitment of our own people. How democratic, humane and just are we to each other? If we cannot derive a consensus on collective action amongst each other, there is little the rest of the world can or will do to help alleviate our misery. ‪50 Muslims were attacked and killed by an Australian born terrorist while they were praying at a masjid. ‪How did NZ, a tiny island of only 4 million people respond? ‪- The entire population mourned genuinely. ‪- They called it a terrorist attack when the attacker was white. ‪- They raised $9million‬ + for the families affected. - All funeral costs to be undertaken by the Government of New Zealand. - Any person caught spreading hate news, or the attack video to be jailed up to 14 years. - They banned guns within hours of the incident. - A huge number of people gathered all over the country to lay flowers outside masaajid and showed their support within hours. - Kiwi people including the New Zealand police and even gang members of the country are patrolling outside masaajid while Muslims pray. - The azaan was played publicly on national TV, radio and every masjid around New Zealand at yesterday’s friday prayers. - The NZ government fast tracked visas in 24 hours to allow families of the affected to enter New Zealand. - Kiwi people opened their homes to provide free shelter, food and support to any Muslim. - Non Muslim Kiwi girls wore the hijab to make Hijabi girls feel safer. - The New Zealand media made sure they covered the Muslim voice in depth and detail, with full interviews with the families of those affected, front page headlines for days and still continuing. - The New Zealand Parliament invited an imam to start a parliament session with an Islamic prayer (First time in History). - Flags flew at half mast. - The Kiwi people filled up parks and beaches with art work, flowers and candles to show that they stand with the Muslim community shoulder to shoulder. - Non Muslim Kiwis are actively staying around Muslims to make sure they feel welcome and at home. They are sitting, talking & eating with them. If this happened in another country, it’s likely the news wouldn’t have even made it to the second page of the News Paper. Alhamdulillah, so proud to be a Kiwi Muslim. Thank you New Zealand. You have made a special place in the hearts of 1.8 billion people...forever. The above helps reinforce my opinion that it is not necessary for Muslims ruling Muslims to be a more secure option for governance. It is quite possible for non-Muslims to provide a more secure environment to Muslims. The example of New Zealand could be a very significant lesson for the Indian sub-continent and its surroundings. In particular, for those who espouse the 2 nation theory. Not sure why we should continue being the proverbial cannon fodder for Pakistan to keep its little cockfight with India alive. Not sure why our houses should be bludgeoned & our lives destroyed. Not sure why our boys are fighting this war of unequals. Can there still be a rational debate? Boosting momentum prematurely could prove fatal. This isn't a T20 or a 50 over one dayer. It isn't even a 5 day test match. Hell! It's not even cricket. This is a game that has been shedding the blood of the hosts for 72 years. There is still no clear sign of it ending soon. کے کنونشن میں خطاب کرتے ہوۓ کشمیر کی خودمختاری کی حمایت کا علان کیا تھا۔۔. This is Imran Khan Sahaab in a JKNSF convention in Rawalakot in 2001. During his adddress he announced his support for an independent Kashmir. (He further explained) that when PTI will come into government, justice will be done with you. No nation can be kept as slaves. Are these not our children? Almost buried in the lap of snow, a picture of helplessness are these children. Situated barely an hour and a half's drive away from Muzaffarabad, in the Union Council of Panjgraan is the village of Chamba where this government middle school is. Hereby is an appeal to everybody to help in constructing a building (for the school). After a gap of 30 years, gold coloured fish were seen today in 'Vimal Kund' Spring at Martand Temple in Anantnag, the Vale of Kashmir. Such a sighting is considered a good omen according to Hindu mythology. Could this possibly mean a new era of peace, prosperity and development in Jammu and Kashmir? At least some elders of the Hindu community here are hopeful that the fragrance of brotherhood and love will spread amongst the different communities residing in the State. Finding an internet signal on the LOC. Should there not be a distinction between pro life and an anti life approach to society? In one corner of the world somebody engages on a killing spree of innocent humans in their places of worship and the world takes immediate notice. In another corner, some people wake up determined to continue their struggle of building bridges between a society driven apart by a man made disaster decades ago. Not many people notice. - 99% of society is corrupt. - You're wasting your time expecting them to respond to humanity. - Our neighbouring State is a beacon of light for the world and we can't exist without them. It takes years for pro life activities to gain traction here.....all that is achieved can be destroyed by a single anti-life activity. It has been reported that roughly 30 student political workers of JKNSF (Jammu Kashmir National Students Federation) along with their central president were arrested in Rawalpindi at around 1900hrs for holding a convention in the city. They are being detained in Raja Bazaar police station. Earlier in the day, I had received reports that the Pakistani authorities had refused permission for the student organisation to hold their regional convention, on the grounds that they were "Anti-Pakistan". It is understood that expressing the aspiration for an independent Kashmir more often than not, invokes allegations of treachery from the defenders of Pakistan's narrative on Kashmir. Various citizens in AJK consider these obstructions of peaceful expression to be an attempt to drive our youth towards violence. The traditionally lively citizens of Hajeera also took to the streets today to protest against the continuing internet blockade in their region. Just like the citizens of the Neelam Valley yesterday, they made it clear that their patience was wearing out. A deadline of two days was given to the AJK authorities (read Pakistani-administered authorities) to restore their connectivity. During their procession and on approach to the Assistant Commissioner's office, they also demanded better medical facilities at the tehsil (subdivisional) hospital which lacked medicine, doctors and other medical staff. Students who rely on online facilities had to travel hours away to the larger cities of Rawalakot or Kotli to fulfil their educational needs. In addition, the public felt they were being economically strangulated by the conflict and its associated restrictions.